The Ikonic's fitted harness and headrest provide synchronised adjustment, and its 5-point harness spreads the load across the body better in the event of an accident. Ikonic includes a new 40-60 cm cushion insert, for newborns, which improves the resting angle and increases safety in the event of side impact. iSize car seat with 360° rotation in both forward and rear facing positions. Makes entering and switching ride positions incredibly easy. It takes only a few seconds to secure your child facing you, then rotate the seat into the desired position. Use the rear facing position from newborn up to 105 cm (birth to 4 years) and then you can choose the forward facing position if preferred when the child gets to 15 months. Forward Facing from 15 months. Forward facing position for children of 76-105cm tall (approx. 15 months to 4 years old). With the new IKONIC from Jané you can choose the forward facing position when the child gets to 15 months, although here at Jané we recommend delaying the use of this second position for as long as possible. Fitted harness and headrest that provide synchronised adjustment. 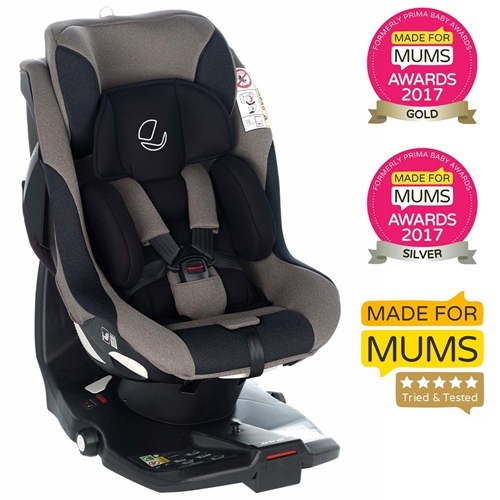 5-point harness that spreads the loads across the body better in the event of an accident. .
New 40-60 cm cushion insert included, for newborns, which improves the resting angle and increases safety in the event of side impact. Easily removed for washing or when baby out grows it. 360° rotating in both positions. Makes placing the child in the seat and switching ride positions incredibly easy. Adjustable headrest with 5 positions while the baby is in the seat. Integrated 5-point harness with one pull adjustment that spreads the loads across the body better in the event of an accident. Isofix + anti-rotation leg. This is the safest installation position, as it prevents any installation errors that could affect safety.